Posted by Jon in Hasbro, Marvel Legends, NYCC 2018 with 0 comments. 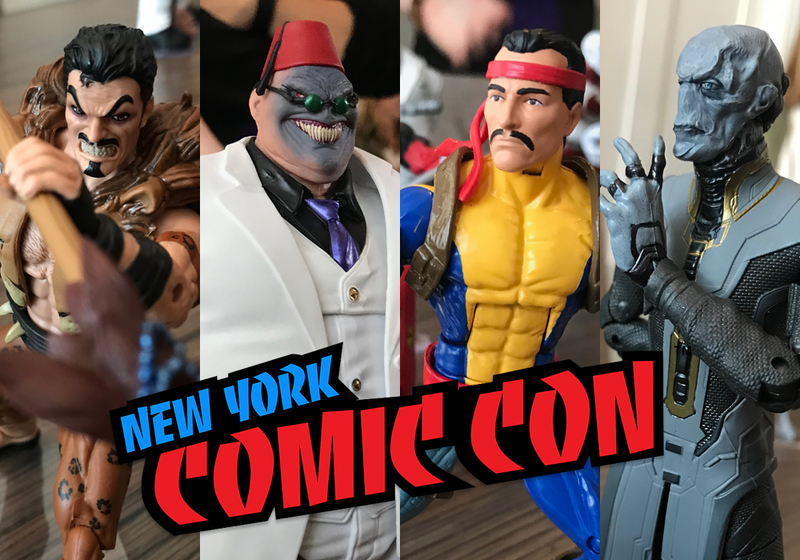 As is an annual tradition, Hasbro took a few of us “press” types aside to a lovely hotel on the morning of New York Comic Convention 2018 to preview some future Marvel Legends. Not only did we get a fairly small scale preview of these figures, but the Hasbro Marvel Legends team sat down with us, talked about the brand’s future, took questions, and suggestions. MCU Corvis Glaive and MCU Ebony Maw revealed, which would complete Thanos’ Black Order from Infinity War. No word on how they are being released yet, but expect them in 2019. Asked if they may revisit Proxima Midnight or Cull Obsidian due to their look changing by the time the movie was released. They said that at the moment they are happy with what is out, but a redo is a possibility. Arnim Zola and Supreme Leader Captain America – You can preorder this pack RIGHT NOW! This two-pack was teased at San Diego, expected release of March 2019. Kraven and Black Suit Spider-Man – Updated Kraven with new facial expression. His body is a bit of a mix between his older look and the more recent update. Packed with a Black Suit Spider-Man that includes an alternate ‘beat up’ Peter Parker head. Jubilee was not shown at the meeting we were in. Her and Night Trasher were later shown at a streaming event. Night Trasher is part of the Kingpin wave, so let’s go ahead and talk about that. Kingpin is the next Spider-Man themed wave’s build-a-figure. He will have an alternate head and cane. In addition to that, Professor X’s rider set will include a Shadow King head that fits perfectly on the Kingpin BAF, if you so choose to make him into that. Everything else related to Kingpin’s wave we saw at SDCC. On the subject of alternate heads, Deadpool’s rider set includes Hydra Bob’s head which can be placed on any Hydra soldier you may own. Finally we have Beta Ray Bill in a more modern costume. He looks great and Hasbro wasn’t ready to reveal where or how he’ll be released. Go ahead and check out the pictures from the Hasbro hosted event. And I’d just like to thank the Hasbro PR team for putting on an exciting show, and giving us access to the people who work on Marvel Legends in order to interact with and share out thoughts on this line.